Wedding Ring For Men In Black : LOVE2HAVE in the UK! 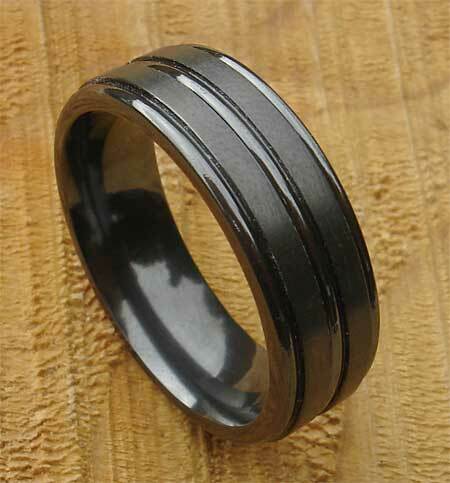 A men's wedding ring made from zirconium in all over black colouring. Our black zirconium rings are trendy these days as men's wedding rings because zirconium is far more durable than precious metals such as gold and silver which can wear away very fast with above average everyday wear and tear. We find this is particularly the case for men which is the reason why we have widened our selection of black zirconium rings for men. This ring is one such example. 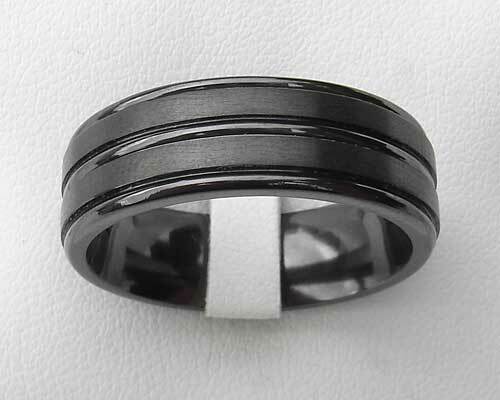 It is a flat profile black zirconium ring with two slightly raised satin finish rails and polished inner detailing. It is the combination of these two finishes that gives this ring its different appearance. The raised rails stand out very nicely from the overall design. Different widths are available, and we offer three with 7mm being the most popular. Width(s) Available: 5mm to 7mm.